Hello is a audio-visual piece in which the projection serves as a score to be interpreted by the ensemble. 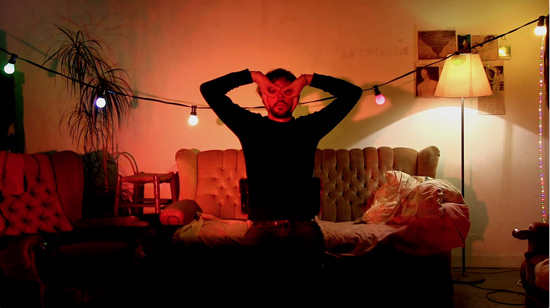 The video consists of gestures performed by the composer in his living room. The piece comes in eight movements and is an invitation into the personal world of Alexander Schubert. Please enjoy. You are invited to use other small instruments or props other than those found in your ensemble. For example toy instruments, everyday household tools or found objects. Chose these instruments in order to fit a given video gesture you want to accompany.